We were living in Greece, and I barely spoke the language. Virtually no one on the island spoke English. We’d find BBC or Voice of America shortwave broadcasts when we were lucky; otherwise I didn’t have daily news of the world beyond the island. On most Fridays, we’d drive 20 kilometers to the island’s main town for shopping. Buying the International Herald Tribune (IHT), an English-language newspaper flown in from Athens on the morning flight, was always on my list. I preferred shopping on Fridays because that was the day IHT published Patricia Wells’ restaurant reviews. Her witty writing transported me to the best restaurants in France. She regularly inspired me to try new and interesting food combinations. I’ve kept up with Wells ever since. She’s written numerous cookbooks, focusing primarily on the foods of France. Wells won the James Beard Award for Patricia Wells at Home in Provence. She still writes an occasional IHT article. 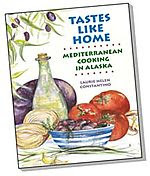 My favorite of Patricia Wells’ many books is her first cookbook, Bistro Cooking. The recipes are simple, straightforward, and unpretentious, yet are consistently full of flavor. Over the years, I’ve made many recipes from Bistro Cooking and never had a dud. I was recently reminded of Wells’ Fennel and Saffron Bread, a Bistro Cooking recipe I used to make regularly. Years ago, I’d gone through a phase of serving several different flavored breads when I made company meals. Fennel and Saffron Bread was one of my favorites for that purpose. When I read about a day for cooking yellow foods to support Livestrong Foundation’s cancer awareness fight, I knew immediately I’d have to make Fennel and Saffron Bread. 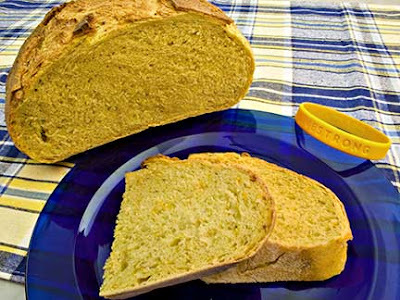 In addition to its wonderful flavor, this bread turns a beautiful shade of yellow from the saffron and semolina flour included in its ingredients. A Taste of Yellow is a Livestrong Day event (May 13, 2008) and is designed to raise cancer awareness. Winoandfoodies is the originator and host of A Taste of Yellow. Mix the water, dry yeast, and sugar in a large bowl. Let sit for 10 minutes, or until the yeast starts to bubble. Stir in the salt, fennel seed, and saffron. Add the semolina flour and let the dough sit for 10 minutes to fully hydrate the flour. Stir in 1 3/4 cups all-purpose flour. Place the dough on a well-floured surface and knead in as much additional flour as necessary to form a stiff dough. Knead for 10 minutes, or until the dough is smooth and satiny. Cut an asterisk in the center of the loaf with a razor blade or extremely sharp knife. (If you have a baking stone, slide the bread - and parchment paper if using - from the baking sheet or wooden peel onto the stone.) Turn the heat down to 375°F and bake for 40 – 45 minutes, or until the loaf sounds hollow when tapped on the bottom. Cool, cut, and serve. NOTE: I prefer using a baking stone when I make bread as it helps my home oven maintain an even temperature and gives bread a crisper crust. I also have an old baking sheet with edges that I use when I make this bread. I preheat the baking sheet and baking stone for at least 30 minutes at 450°F (the stone on the shelf above the baking sheet. I turn the heat down to 375°F when I put the bread in to bake. Just before I close the oven, I dump a cup of water into the hot baking sheet and quickly shut the door. (Do not throw water directly on the oven floor or it will warp. Trust me, I know this from experience.) The water creates steam which prevents the bread from quickly forming a hard surface, thus allowing the bread to rise to its fullest extent. 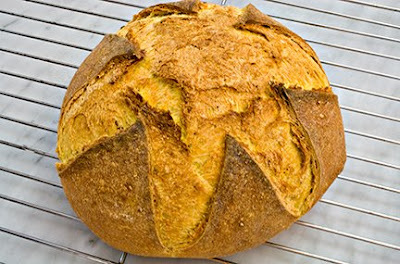 The water cooks off quickly, and leaves a hot, dry oven which, together with the baking stone, helps ensure a crispy crust. This post is dedicated to our good friend, Ron Zobel, who died way too young from esophageal cancer. Your bread is so wonderfully yellow. I love Patricia Wells books too. The bread looks fabulous from the saffron and yes...fitting for Kakavia. Beautiful photo, the yellow "Live Strong" bracelet was a perfect touch. Beautiful bread too! I'm another Patricia fan too and have several of her books. Fabulous looking bread. Thanks for supporting LIveSTRONG With A Taste Of Yellow. Kalyn, it is most definitely yellow! BTW, next month Wells is publishing her next book. Lulu, I hope we all "Live Strong". Manju, good idea about the bread and the meatballs (too bad I already ate the leftovers). Saw your recipe and it sounded wonderful. Oooh...pretty! I will have to try this one. I may adapt it to the no-knead master recipe I have been playing with to get a looser crumb amd more air in the dough. I love the idea of this bread. saffron and fennel seed are two of my favorite flavors. I am bookingmarking it. now! Maria, that is a very intriguing idea - I'll try it next summer! Hank, I do love the color! I'd be interested to see how your experiment comes out! Vansachsen, thank you! As for Bistro Cooking, I can't say enough good things about it. Never Full, so glad you like it!